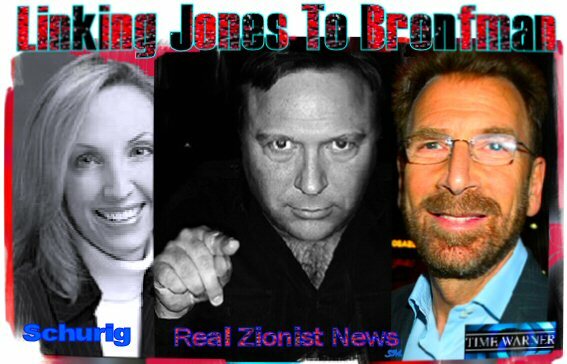 IS ALEX JONES LINKED TO ZIONIST-JEW BRONFMAN? 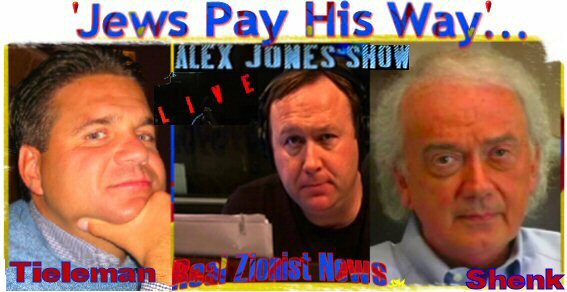 THE CONTROVERSY OF ALEX ‘BULLHORN’ JONES being an alleged Zionist shill has now expanded to his apparent Zionist-Jewish connections on his 1) Personal Staff 2) Website Advertisers 3) Link To Time Warner President, Edgar Bronfman Jr.
Jones’ seeming allegiance to Zionism, which explains why he virtually never targets Zionist Jews or the racist, Zionist rogue state of Israel when engaging in his notorious rants and attacks, may well stem from a Protestant-Zionist belief system, and the widely circulated reports that his wife is a Jew – – which makes his two children Jewish under Talmudic law and eligible for the Israeli Law Of Return. In that Jones’ wife is of Jewish heritage, both she and the children would be automatic dual citizens…Alex would not qualify. With additional information on Jones which this site is now providing, Alex Jones’ Zionist connections prompting his reticence to expose global Zionism, becomes ever more obvious. And to add insult to injury, Jones recently interviewed a Zionist-Jew professor, a “Dr Jonathan Levy,” who railed in typical Jewish fashion against the Catholic Church as being part of the New World Order. Yet, not a word from Jones and his Jewish guest about Zionist Jewry being the real driving force behind the NWO. Rob Jacobson: Jones’ cameraman. Jacobson also does film and video editing work for Alex Jones. Aaron Dykes: He does web-mastering and video work for Jones’ Websites, Infowars and Prisonplanet. Jason Bermas: He hosts Jones’ radio show, The Alex Jones Show, when Jones is on vacation. Bermas recently attacked all critics of Jews, calling them, “Anti-Semites” and stating that they should all die. Henri-James Tieleman: President of EcoloBlue Life & Energy. Tieleman does live, on-air 10-minute commercials on Alex Jones’ radio show, and the regular recorded commercials are voiced by Alex Jones himself. Tieleman also has a large flash animation banner advertisement at the top right-hand corner of the main page of Alex Jones’ Prisonplanet Website. Steve Shenk: Director of the Michael Stevens Group. Shenk advertises his subsidiary, eFoods Direct, on Alex Jones’ radio show. See Shenk On The Alex Jones Show Here. Allen L Schultz: Owner of Pre-Paid Legal Services, Inc. Schultz often uses an animated banner advertisement at the top right-hand side of the main page of Alex Jones’ Prisonplanet Website. View Jones’ Entire Jewish Advertisers Here. HOLLY BRONFMAN LEV IS Edgar Bronfman Jr’s sister. As founder of the Bet Lev Foundation and 100% owner of Lev Group Ltd, Holly Bronfman’s legal affairs are conducted by the high-powered lawyer, Elizabeth Schurig, who also happens to handle the legal affairs of Alex Jones. Schurig’s legal office is located at 100 Congress Avenue, 22nd Floor, Austin Texas 78701. Of particular note, on January 3, 2008, Schurig changed Jones Productions LLC to the same address as her legal firm, 100 Congress Avenue. The “Governing Authority” of Jones’ Infowars LLC and his Jones Report LLC are also at the address of Schurig’s law offices. The Alex Jones Machine Website puts it all like this — “So now Alex’s corporate addresses is a Bronfman’s lawyer’s address?” View Entire Story Here. At the very least, the Jones revenue-streams from his Jewish sponsors present far too many obstacles for him to discuss world Zionism to any realistic degree. Sponsor revenues aside, Jones’ Jewish connections are, indeed, profound, wide-ranging and number far too many for him to dare report the facts and dynamics of the Zionist control, influence and subjugation of much of the planet…even if he wanted to. IS ALEX JONES A ZIONIST SHILL? Jerusalem, Blood and Dynasty: A Look at Edgar Bronfman, Sr.